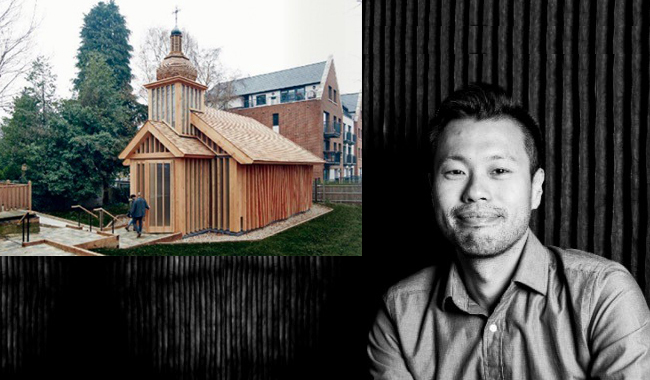 London-based architect and founder director of the Spheron Architects studio Tszwai So oversaw the construction of the first wooden church built in the UK capital since 1666. So will be present at Egurtek, the only congress of its kind in Spain, to be held over 18-19 October at the BEC. Bilbao, 18 June 2018. Tszwai So will be one of the speakers at Egurtek, the International Forum on Architecture and Construction in Wood, to be held over 18-19 October at the Bilbao Exhibition Centre. The London-based architect, founder director of Spheron Architects, is fascinated by traditional Belarusian wooden churches, and wished to honour them in his London Memorial Chapel project, a small chapel dedicated to the memory of the victims of the Chernobyl nuclear disaster of 1986, marking the 30th anniversary of the catastrophe. So added a contemporary twist to the traditional forms and materials of Belarusian country chapels to create the first wooden church to be built in the UK capital since the Great Fire of 1666. So’s idea was that of a chapel having “the aesthetics of the Byzantine rite”, the design of which would reflect “the spirit and identity of Belarus and the Belarusian people”. Timber was the main construction material used in Belarus for centuries and most of the buildings in the capital, Minsk, are timber-built and date to before World War II. The new church is timber-clad, with restricted areas of latticework windows and obscured glazing, as the religious items inside, particularly the icons, are very vulnerable to direct sunlight. However, So also wanted natural light to enter, and added a series of panels and high clerestory windows, giving no direct view of the outside. The result is essentially a windowless church, reflecting the inward-focussed Byzantine liturgical tradition. The design of the undulating flank walls was inspired by the traditional vertical timber cladding of the Baroque churches of Belarus. Though apparently vertical when looked at full-on, the effect is of a profile that changes as the visitor walks around the chapel. The shadows cast on the chapel by the sun also vary depending on the time of day. Working with designer and manufacturer Andrew Trotman allowed So to design a traditional-style wooden structure with exceptional details. The church is surrounded by 13 lime trees and four slender birch trees, more than 60 ft tall. Fifteen of the trees are statutorily protected. The Egurtek Forum is sponsored by the Basque Government’s Department for Economic Development and Infrastructures and has as its mission to promote construction in wood. For the Basque forestry and timber sector, represented by Baskegur, the event provides an opportunity to network with local businesses and to discover the quality of the wood produced by Basque forests and its use as part of a sustainability and zero-kilometre material consumption strategy. The presence of world-famous architects and a series of technical workshops also contribute to offer a modern, vanguard image of the timber construction sector. Egurtek is held every two years at the Bilbao Exhibition Centre. The 2016 event welcomed 2110 visitors and 60 exhibitors. Architects at that edition included Pritzker Prize winner Shigeru Ban.